A neatly trimmed hedge can add immensely to the beauty of your yard, as well as increasing your privacy. Yet, they can quickly grow out of control. By choosing the best hedge trimmer for your budget, you should be able to keep it in perfect condition with absolutely no fuss. Why Do You Need a Hedge Trimmer? The first point to consider is why you even need a hedge trimmer in the first place. Perhaps you have always carried out this task manually in the past with hand-held shears or other garden tools. This can lead to a reasonable job but there are some big advantages to be gained from making the switch to a hedge trimmer. This is a way of trimming your hedges that is far quicker than doing it manually. If you have a busy lifestyle or a large hedge, the extra speed that this offers can make a big difference. The power of a good hedge trimmer also allows you to cut through even tough sections effortlessly. As well as saving you time and effort, this also reduces the risk of injury by removing the need to exert yourself. You don’t need to be an expert to use one of the machines. They are typically designed so that anyone can pick one up and start using it right away. Naturally, you do need to be careful not to injure yourself, but they are far less intimidating than many other tools out there. Figures from a few years ago show around 3,000 hedge trimmer accidents in the UK each year, so be sure to choose a model that you feel comfortable using. Finally, this approach helps to achieve a neat, uniform finish. If you use your trimmer correctly, it will give you an attractive hedge that you are proud of. This video gives you some tips on how to do it well. What Features and Specifications Will Make Life Easier? Clearly, choosing the best hedge trimmer with the right features and specifications will go a long way to making this tool easier to use. If you choose the right model, it will make light work of your hedge while letting you feel completely in control of it as you cut through the branches. The following are some of the key features that you should be aware of. There are plenty of excellent models out there that you could choose from. At first glance you might think that they are all very similar just judging them on their looks alone. Yet, by taking into account those features and specifications mentioned earlier, you can make an informed choice on which is most suitable for you. Are you going to be using it far from your home’s electrical outlets? If so, then a cordless model with a long-lasting battery, or a gas-powered model, will allow you to work without any worries. You should also choose a size and weight of hedge trimmer that suits you. This needs to take into account your size and strength, as well as the dimensions of your hedge. You don’t really need a massive trimmer with a huge blade for a small, domestic hedge anyway. On the other hand, if you are going to be using it on huge jobs then a bigger, more powerful trimmer will be needed to take the strain. Naturally, the price is also a major issue for most of us. If you only have a small hedge to deal with, it is unlikely that you want to spend a lot of money on a hedge trimmer for it. However, if your garden is your pride and joy then you may feel comfortable spending more on a high-quality trimmer that gives excellent results every time. As for the brand, there are some big names included in the models that we have reviewed. If the brand is important to you then be sure to see whether your favorite, trusted names are covered. It is also worth bearing in mind that a lot of manufacturers now have power systems that let you share the battery across their range. So, if you already have some tools from a particular manufacturer it might make sense to buy your hedge trimmer from them as well. It is also important to think about how often you will be using the trimmer, and on what type of hedge or bush. Is it something that you will use maybe just a couple of times a year for light cutting? Or will you be giving it far heavier usage on a more regular basis? The answer to this question will let you see the power and durability that you need. This is part of the DeWalt 20v MAX range of power tools that currently features over 100 products of different types that can share a battery. It is a light and compact device but it also includes a powerful motor and an impressive 5 Ah lithium ion battery and charger, to ensure that it can be used anywhere without any hassle. The size of the product is 38.7 x 9.4 x 7.9 inches and the blades have a ¾” cutting capacity. 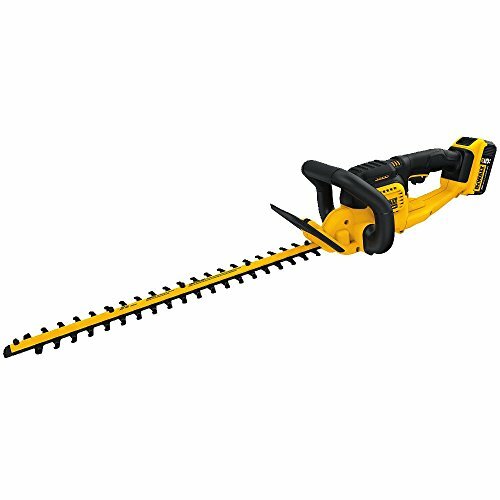 This DeWalt hedge trimmer is capable of cutting branches of up to ¾” in thickness using a 22” long cutting blade. The whole thing weighs just 7.5 pounds. This hedge trimmer comes with a 3 year limited warranty from the manufacturer and also 1 year of free servicing. In addition, a 90 day money back guarantee adds to the peace of mind that it offers. It is good to see that is also a virtually maintenance-free option that you can simply use any time that you need it and then store it away again at the end of the job. 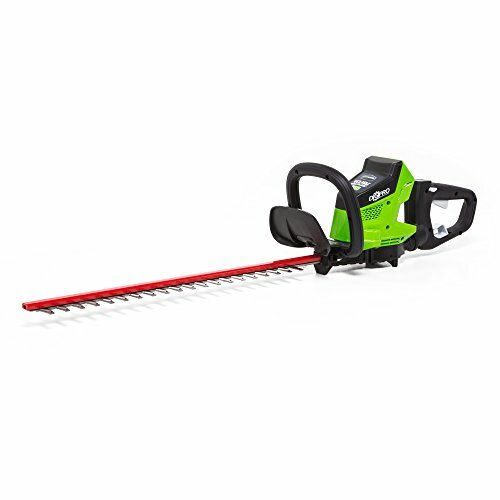 This Greenworks hedge trimmer promises a run time of up to 60 minutes thanks to the G-MAX 40V Li-Ion Battery System that uses a 2 Ah battery and charger. One of the interesting things about this device is that it has a 180° rotating rear handle. This is designed to make it easy to hold the trimmer comfortably while cutting at virtually any angle. You may find this to be particularly useful if you have an awkwardly shaped hedge that you need to get into some difficult positions in order to cut. The cutting is carried out by a 24-Inch dual action steel blade that has a 2/3 inch cutting capacity and that carries out up to 3,000 strokes per minute. This means that it can be used to make relatively light work of even tough hedges and bushes. This tool produces 60% less noise and vibration than gas models and is also 60% lighter than them too, although these figures are pretty standard for electric hedge trimmers of any type. The use of 16-inch dual-action hardened steel black means that this trimmer vibrates a good deal less than Black and Decker’s single-action bladed tools. 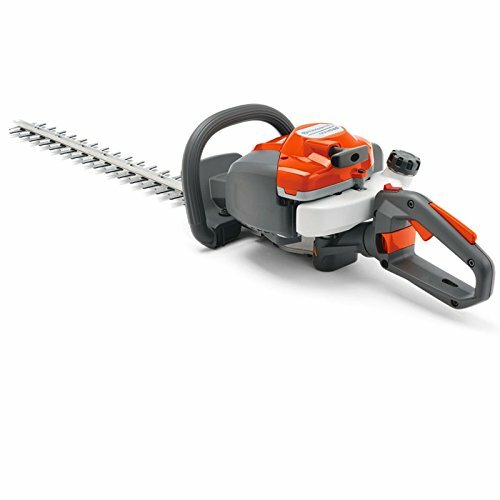 It comes with a 3.0-amp motor and it can be used to trim branches of up to 5/8 inches of thickness if necessary, so even tough, gnarly hedged can be tackled without fear. In terms of the overall size, it measures in at 4.5 x 30 x 6.3 inches, while the weight is just 4.55 pounds. The weight and size mean that it is popular with people who don’t want to struggle with a big, heavy device. This is a corded model but it comes with cord retention design so that it doesn’t get accidentally unplugged while in us. Having said that, with so many cordless models on the market just now, you need to carefully consider whether you would be comfortable using one with a cord. The actual cutting is made simpler due to the built-in handle and full-length trigger that give you more control over the trimmer. Expect to get a limited 2-year warranty with this device. This is a light and portable, cordless hedge trimmer that is designed to be easy for anyone to use anywhere. It uses dual-action cutting blades for fast and clean cuts with very little vibration felt by the user. The D-grip front handle is also useful, as it allows you to very easily trim from above or else from either side. There is also an over-mold soft grip handle that gives you a comfortable grip that won’t tire your hands out too quickly as you work with it. This model of cordless hedge trimmer only weighs around 6 pounds. It can also share the batteries used in the Worx 20V Power Share range of tools for added convenience. It is a device that you might be interested in if you need to keep particularly tough hedges in shape but don’t want a big, awkward tool to cut them with. The 9/16-inch cutting diameter should be enough for most people to carry out jobs around the garden. 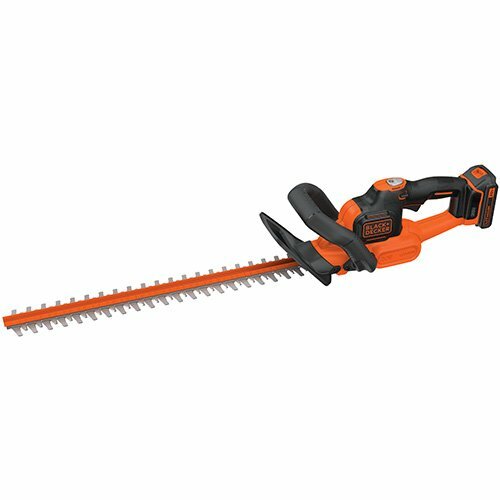 An ergonomic grip and low vibration levels mean that this is the sort of hedge trimmer that you can use with confidence even if you have never used anything like this before. The device runs off a 20V Max lithium ion battery that promises up to 3,000 square feet or cutting power with a single charge, which should work out as around an hour or so. Unless your hedge is extremely large, a single charge should be enough to get it all trimmed on one charge. 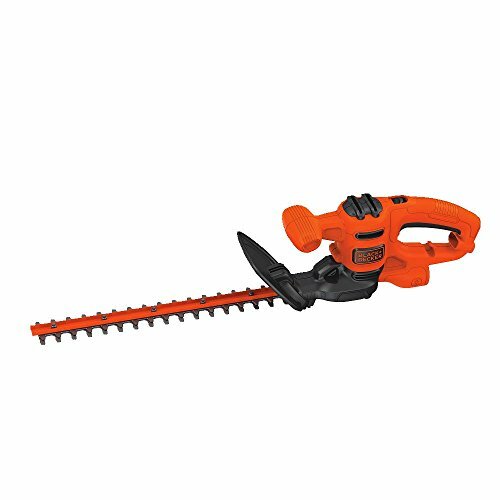 This Black and Decker hedge trimming machine weighs 7.8 pounds and measures 40 x 7 x 7.5 inches. The dual-action blade is 22 inches long and it can slice through branches of up to ¾ inch in diameter. Another interesting feature is the POWERCUT button. This lets you blast through a jam with a single push of the button, which can come in handy on awkward sections of hedge. This hedge trimmer has been designed to start up speedily and effortlessly, thanks to its Smart Start engine. It is a gas-powered trimmer and it includes a carburetor air purge system that gets rid of air from in the system to let it start up quickly. A slow startup time is a common problem with gas-powered trimmers and it is one of the reasons why so many people prefer electric models these days. If you prefer to use gas but don’t want to waste, this is a model to keep in mind. At just over 16 pounds, this is a heavier machine than many of the electric hedge trimmers around just now. However, it does have anti-vibration dampeners that help to make it easier to use by cutting down on the stress generated on the user’s arms. Another helpful touch is that you can adjust the rear handle so that it is easier to trim the top and the sides of the hedge with it. As we have seen, there are some differences between the best hedge trimmer models out there. Which one is the very best? In our opinion, the top choice is the Black & Decker LHT321FF. This machine shares a lot of the best traits of other top models, all brought together in one package. It is light, easy to handle, powerful, and has a long-lasting battery, just like you need your trimmer to be. While other hedge trimmers have one or more of these attributes, none of the others that we have looked at has them all. We also loved the way that the POWERCUT button lets you effortlessly blast through any sort of jam.